Pages 5 & 6 for ‘I Have Decided’. This was originally supposed to be one image like all the rest. But after seeing the level of detail and requirements needed for this image, Katy and I agreed to make this image a double-page spread. It is the scene where an angel descends from heaven to inform Mother Mary and Mary Magdalene that Jesus has been resurrected, as he opens Jesus’ tomb to reveal that it is empty. The centurions are taken aback by this sudden revelation. A lot of things were required for this image; an angel, both Marys, at least two centurions acting shocked, the empty tomb, and evidence that this all takes place in the early daytime. 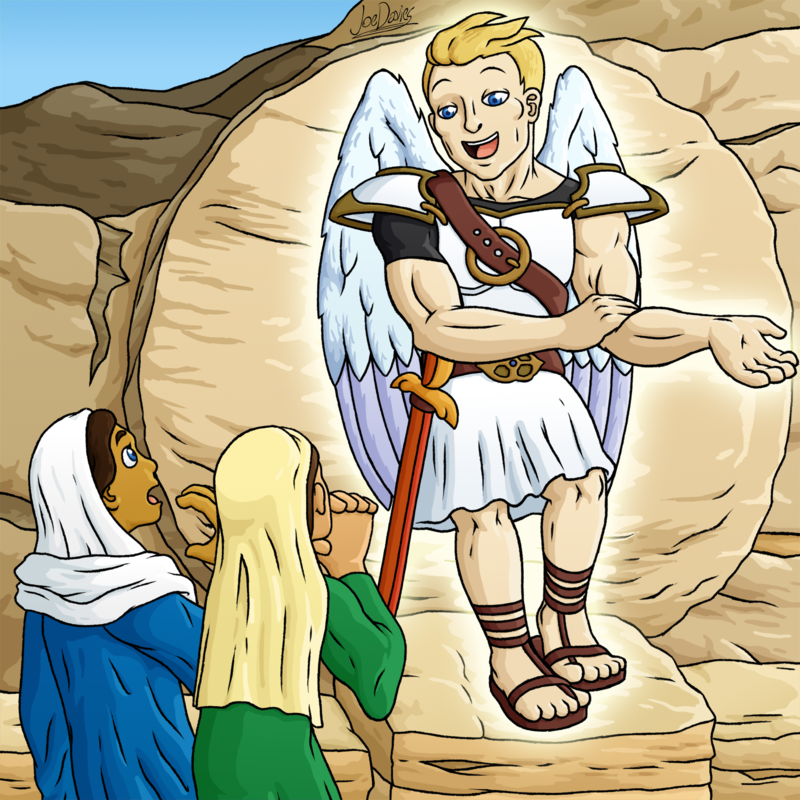 And given the description of the angel in the Bible passage, he is meant to look formidable, but also friendly. So I also had the idea of drawing him to be much bigger than the humans, and made it show in an initial sketch. But in the end, there was too much to focus on in just one image, so we settled on making two. One that focused on the angel delivering the news, and the other showing Jesus’ empty tomb. The designs of both Marys weren’t vitally important to this image, but it’s clear that the angel would get the most focus, thus some thought was put into how he is meant to look. Apparently, angels aren’t supposed to be the loving little cupids that we often see in most mainstream media, but rather strong looking soldiers, garbed in bright white armours, intimidating statures and blazing swords. At the same time though, they also have to look friendly, in order for the concept of Heaven to still be inviting. 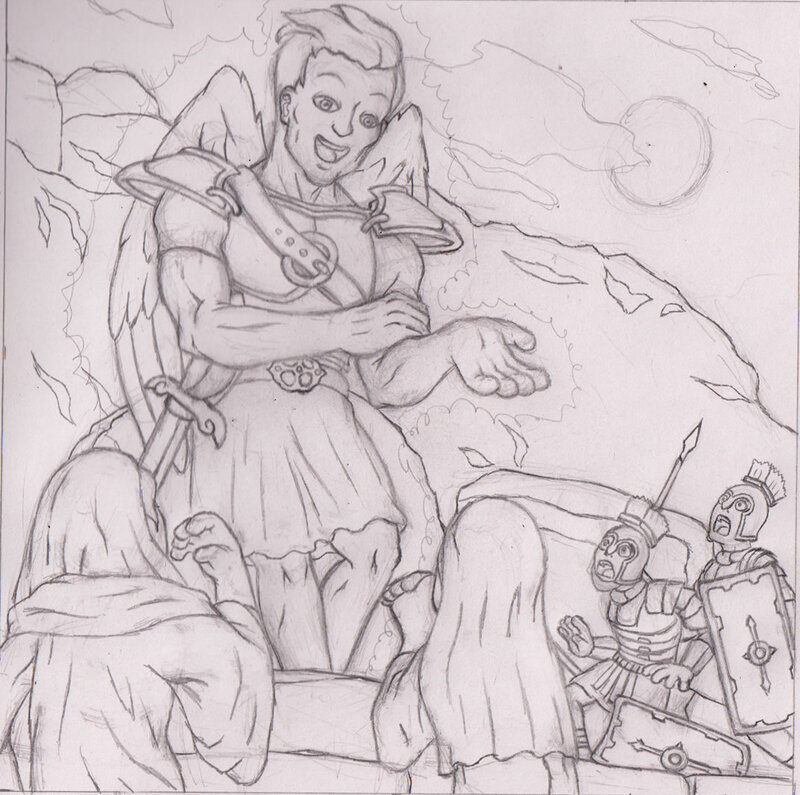 So I designed this angel to be very well-built and in classic armour that is coloured in the brightest white. Katy didn’t want him looking too feminine, and so I was tempted to give him facial hair, but I felt too many characters in this book have facial hair, so I wanted to see if I can still make him look strong and tough without the need for chin whiskers. Drawing the centurions with their mouths agape was quite fun. 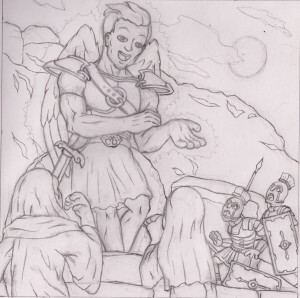 I wanted the two images to seem connected with one another, and so I made sure that one of the soldiers was facing in the direction of the angel as he is taken aback. 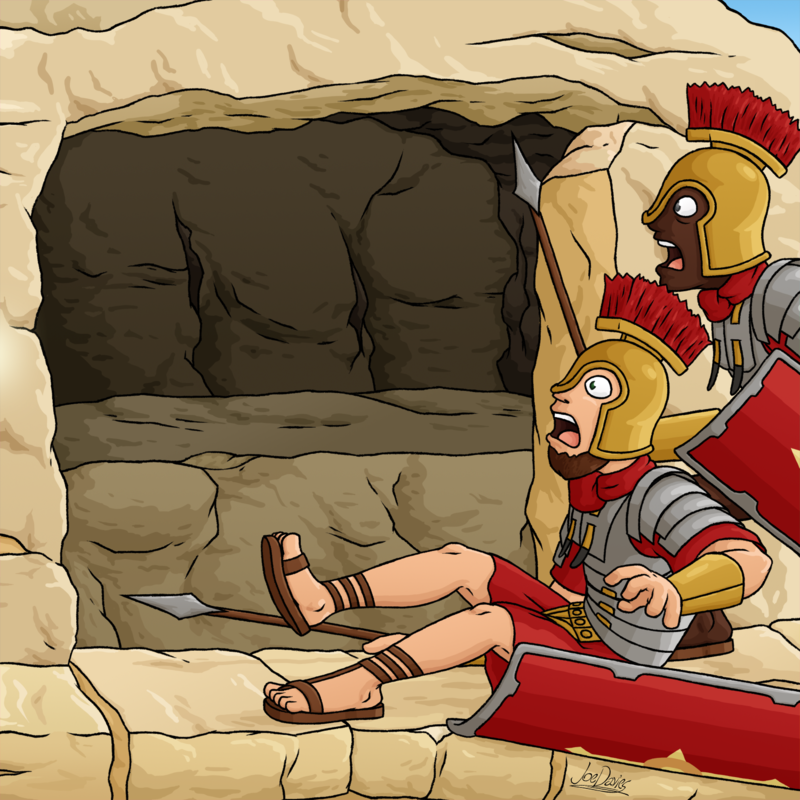 And also how the angel is gesturing towards the empty tomb to his left. This is the image that took the most work in the end, but it was worth it because I think it came out splendidly.